I only stopped playing Rocket League to write this article, and man am I ever itching to get back to it. It’s the little things that helped this one blow up. The feel of careening head-long into other cars or the ball or even a wall. The adrenaline rush of boosting at the ball at the same time as everybody else, praying you’ll nose it in the right direction before ricocheting off the other team like a two-ton pinball. The knowledge that you’ve committed to said boost, and you can’t slow down now even if you want to. Cars aren’t like people. Wheels + thousands of pounds of screaming steel = forward motion, raw and spectacular. There’s a beautiful balance at play in Rocket League. You’re this heavy, speeding rage machine, but you’ve also got to be precise, even dexterous. If the ball’s headed your way, you’ve got to plot your trajectory and smack it at exactly the right time. It’s almost like playing pool at 150 mph. Or let’s say your teammate slams into the ball with all his might—and let us say his name is, “Nathan Grayson, why do you always do that”—and it bounces off the top of the other team’s goal. You’ve got to position yourself just right to jump and... headbutt it in? Cars don’t really have heads or butts, but you get the idea. Oh right, these cars can jump. That’s kinda important. They can also drive up walls. Pro-tip: if the ball is going up the wall, jump at it. Second pro-tip: actually just jump a bunch. Third pro-tip: jumping is fun. The cars can wear hats, too. That’s also important. I lost my first few matches. Striking that balance between precision and, um, being a goddamn car takes some time. My epiphany came during this one match, when all of my allies and foes were duking it out toward the right side of our goal. I saw the ball pop out, like a wet bar of soap squeezed a little too tightly, and knew it was then or never. 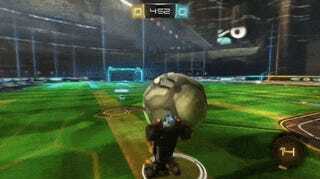 I rocketed out of the goal and rammed the ball. It blasted in the general direction of the other team’s goal, which was totally unguarded. But then I noticed that the ball was veering slightly to the right. I angled and boosted. I ended up banking it just right, and the other team caught up just in time to helplessly watch as the ball gently slid into their goal. That was when I got it. I was hooked. The rest of the game is simple, albeit kinda barebones. There’s experience to gain and items to unlock, but none of them affect gameplay. Modes are basic, sticking mostly to typical soccer rules (aside from the one that reads, “No cars under any circumstances ever”). There’s a season mode, exhibitions, and online play with leaderboards. You can also watch and edit replays. I’m not sure how much lasting appeal it will have (though the number of hours on alpha players’ profiles is encouraging), but right now I’m all about Rocket League. Now if you’ll excuse me, I’m gonna sneak off to play a couple more matches before I have to write something else. Don’t tell Stephen.